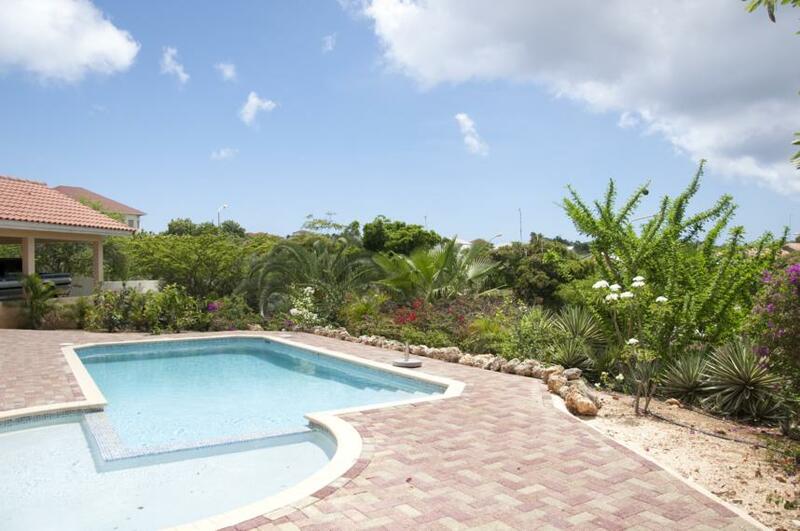 This villa on Curacao is very spacious (450m2) and is conveniently divided into two living areas: the villa and a separate built-in apartment, which are interconnected. Thanks to this unique division this villa is perfectly suited for 2 groups of people wanting to spend their vacation together – people that love to share time together but can also appreciate privacy. This possibility of choice makes this villa very special and is perfect for big families, weddings or other special occasions. The apartment is never rented out separately, so you have full privacy at all times. In its entirety the villa has 5 furnished bedrooms that are all equipped with air-conditioning (an indispensable asset for a villa on Curacao), 3 modern bathrooms and 2 fully equipped kitchens and can comfortably accommodate up to 10 adults. The villa has a spacious living room and a separate entertainment room with a TV, stereo and wireless internet connection, the apartment has its own separate living room. Around the villa there is a secluded lush tropical garden. In the garden there are two interconnected swimming pools: a baby pool and a regular big pool. Both of the swimming pools lay right next to one of the three porches that villa possesses. The front porch offers a scenic view over the garden and the swimming pools, which are lovely and illuminated in the evening. From here you can also enjoy a panoramic view over the most exclusive neighbourhoods for a villa on Curacao: Vista Royal and Jan Thiel. From the cosy back porch where you can enjoy your meal, your morning coffee, or spend time relaxing you have a serene and peaceful view of the luxurious tropical garden. Here relaxation comes easily! The villa lays on a hill, which means no matter where you chose to spend your time – at the pool, in the garden or on one of the porches, this tropical kingdom is yours and yours only. The apartment is spacious and de luxe and is a part of the villa. It has a large living room with an open kitchen. The apartment also has a large shaded porch. The porch and its own entrance to the apartment lay on the side of the villa, which gives you almost an absolute privacy from the rest of the living space in the villa. There are two bedrooms that can welcome maximum four adults. All of the bedrooms are equipped with air-conditioning and big ceiling fans. The apartment also has a comfortable and modern bathroom. The kitchen has all you need and has above other things a gas stove, a big refrigerator and a microwave. The apartment is wonderfully situated – with lots of refreshment from the cool trade winds, surrounded by a lush tropical garden and has an absolute privacy. This is the place to enjoy! Space, space and even more space – this is what you find outside your villa: the tropical garden is as large as 1.800 square meters. In the garden you will find various tropical plants, flowers and trees. 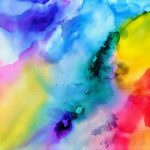 Among many others there are coconut trees, oleanders, mango trees, pomegranate trees and bougainvilleas. Of course you can eat all the fruit from the garden. Not only are they delicious, they attract a range of tropical birds such as bananaquits, trupials and various sorts of hummingbirds. 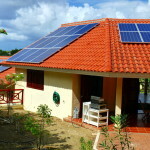 A wonderful sight perfectly suited for a villa on Curacao. The swimming pool is 8 by 4 meters, and is interconnected with the baby pool. The baby pool is shallow and is great for the little ones. Next to the pools there is a parasol for a cool shade, where you can relax on a comfortable deck-chair. 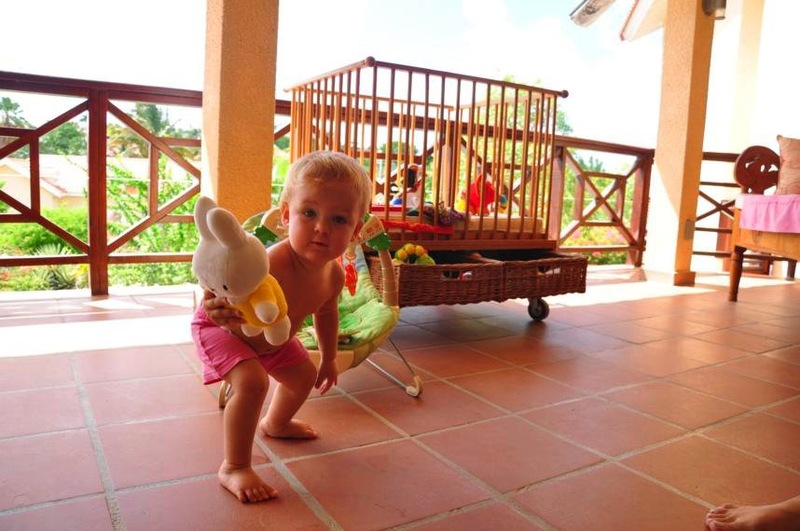 There are a number of amenities for families with children inside and outside your villa on Curacao. There is a shallow baby pool next to the swimming pool where kids can safely play, under the adult supervision, of course. Thanks to the gated garden your children will not go on adventure outside the villa on their own. And of course the villa is fully equipped for the kids, big or small – there are cribs, a car seat, a high chair, bouncing chairs, playpens, baby bath and all kinds of toys. More safety for your children simply means more pleasure for you. 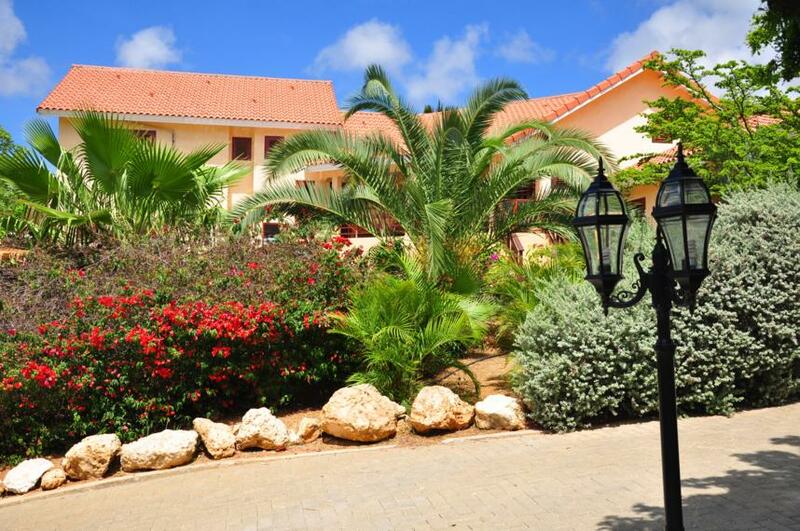 Your villa on Curacao is situated very centrally in one of the most charming villa neighbourhoods of the island: Jan Thiel. The Caracas Bay beach and the popular Zanzibar are within walking distance from the villa. Just a ten minute ride in a car and you are at the most beautiful and well-known beaches of the island, such as the Mambo beach, Kontiki beach en Seaquarium beach. The biggest grocery stores, bakeries and supermarkets are also just a few kilometres away and are among the best of Curacao. The salt planes of Jan Thiel, a magnificent nature reservation is situated just within a 5 minutes walk, where you can go for a peaceful walk and enjoy watching flamingos. Also in the neighbourhood there are various diving schools and diving spots near the Caracas Bay beach. This way you can stay active and enjoy your vacation even more.Also very nearby are many very different fine restaurants with interesting and varied menu’s: Miramar (Japanese), Il Forno (Italian), Zanzibar (beach restaurant, great pizza’s and salads), Surf and Turf (on the beach with your feet in the warm sand), De Kleine Wereld “The Little World” (on the Spanish Water, just 2 minutes walking distance) and many, many more. There is definitely enough culinary diversity all in the close vicinity of our villa on Curacao. If you are curious about the history of the island there is an enchanting place to see with your own eyes just 15 minute away – a jewel of the UNESCO heritage list – the historic centre of the Willemstad, Punda. 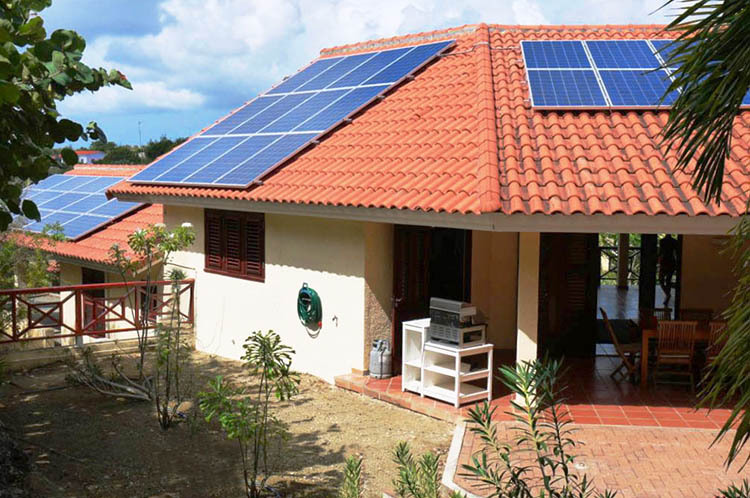 There are as many as 35 solar panels on the roof of the villa, generating enough energy to fully cover the electricity usage villa requires. The construction of the villa allows the cooling trade winds to pass freely through the villa. 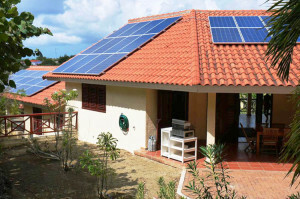 Those two natural factors: the sun and the wind make our villa a vacation home working only on sustainable energy, where you can enjoy your holiday on Curacao, feeling completely at peace, and closer to the nature than ever before!